Forex charts are part of the trading platforms like Metatrader4 or Metatrader5. The charts are where you are able to view the price movement of the different currency pairs. You simply have to choose the currency pair that you want from the market watch, symbols list and drag it to the chart space. The chart displays the price movements depending on the chosen timeframe (the duration from the open to the close of a bar or a candlestick). The timeframes range from 1 minute to 1 month. There are three different types of Forex charts that a trader can use. All the three types comes with the trading platform (e.g. Metatrader4, Metatrader5, etc.). The trader can easily switch between the charts depending on what type of chart he or she decides to use. This draw a continuous line that shows the market price movements. The bar chart is not preferred by many traders since it more complex. It draws vertical lines (bars) that show the opening and closing prices, and also the highs and lows. The bottom of the bar shows the lowest market price reached for that time frame, while the top indicates the highest market price reached. For the trader to recognize the opening and the closing of the bars, there is a horizontal hash on the left side of the bar that indicates the opening price, and another horizontal hash on the right to show the closing price. For the trader to distinguish between a bear and a bull bar, he or she has to carefully examine the horizontal hashes. A Candlestick charts displays the same market price information as a bar chart, but in graphic format. The region between the open price and the close price is thick and field with a specific color depending on whether it is a bull or a bear candle. A bull candle is the one that shows a rise in the market prices while a bear candle is on that shows a drop in the market prices. The colors makes it easy for the trader to easily identify the market trend. Most traders uses technical trading methods which entails using the help of indicators to study and predict the market movements. 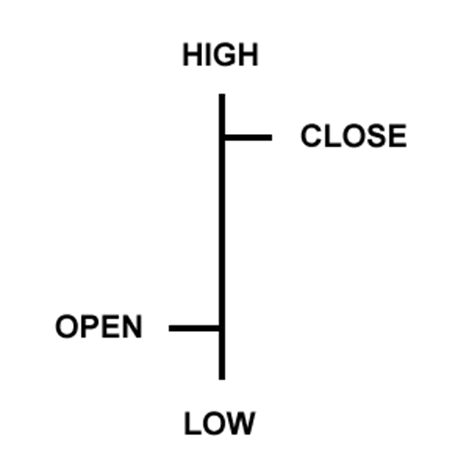 The indicators gives signals of when to place a trade and also when to close trade. Also, the indicators also tell the traders which kind of a trade (either a sell or a buy) to place. For you to insert indicators to your trading chart, you simply have to click on the insert button at the top of the trading platform (e.g. MT4, MT5, etc.) that you are using and choose the type of indicator that you want to use. Once you choose an indicator, double click the indicator and click “OK” on the pop up window that appears. Some indicators come with the trading platform while some have to be downloaded or even bought and copied to the indicators sub-folder of the folder containing the trading platform (e.g. MT4, MT5, etc.) that you are using. For you to find the downloaded indicators that you have copied into the trading platform, open the trading platform and click on the insert button at the top and go to the indicators and scroll down to the customs and you can check for the indicator from the drop down list that appears.